The first symptom could be death. SCA can strike anyone, regardless of age, gender or ethnicity. Even being in excellent health is no guarantee. The syndrome has affected professional athletes and people with no known health problems. While SCA often has no warning signs, a study published by the Journal of the American Board of Family Medicine (2012) revealed that 72% of students who suffered from SCA were reported by their parents to have at least one cardiovascular symptom before SCA. They just didn’t recognize it as life threatening. That’s why it’s important for everyone to understand potential warnings and risk factors based on your family’s heart history. Check in with your youth about whether they experience any of these warning signs. 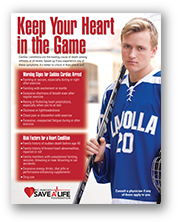 Annually, and especially at the start of each sports season, thoughtfully complete a cardiac risk assessment with your youth to inventory any unusual physical symptoms they may be experiencing. Discuss any findings immediately with your doctor, as well as family risk factors—and always get checked if your child experiences fainting, as it is the number one sign of a potential heart condition. The reality is that we live in a very competitive world, and kids are daily encouraged to rise to the challenge. Young people often don’t tell adults if they experience symptoms, and parents often urge their kids to play hard and be tough. Student athletes (and often their parents) don’t want to jeopardize their playing time, so they may avoid telling parents or coaches in hopes that the symptoms will “just go away” on their own. Kids may be embarrassed they can’t keep up, thinking they’re out of shape and just need to train harder. Having felt this way all their life, they may be unaware that what they are feeling indicates a potentially fatal condition. There is not enough dialogue and education in parent, school, sports and medical communities about warning signs and how to recognize them. We need to let our kids know that if they experience any of the above symptoms, it is crucial to alert an adult and get follow-up care right away with an appropriate physician. Additionally, if the youth has any of the SCA risk factors, these should also be immediately discussed with a doctor to determine if a heart screening is needed. 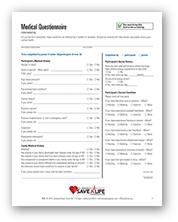 Download the Cardiac Risk Assessment form and bring it to your annual well-child exams and pre-participation sports physicals.